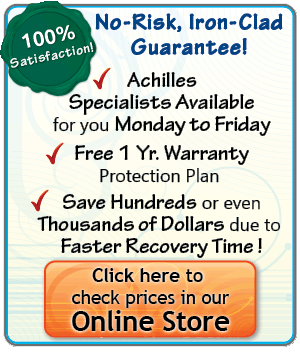 When you suffer from an Achilles tendon injury, such as tendinitis, an Achilles tendon rupture, Haglund's Syndrome or retrocalcaneal bursitis, your knees may experience unbalanced loads as you favour your sore ankle. This can cause excess strain on one of your knees, over working your ACL (anterior cruciate ligament) and causing it to experience tears. The anterior cruciate ligament (ACL) is the key ligament which bonds together the upper and lower parts of the leg at the knee, stabilizing the knee and limiting the rotation and forward/backward motions. In the United States, it is estimated that ACL injuries happen to 1 in every 3000 people and usually occur when the foot is planted firmly and the knee pivots, twists or overextends suddenly. ACL injuries account for more than two-thirds of all knee injuries in skiers and are fairly common in other sports such as volleyball, basketball, and racket sports. A ruptured ACL is typically diagnosed by a doctor - an MRI exam is advisable, as this can also identify whether the meniscus (cartilage in the knee that provides cushioning) is damaged as well. Some ACL tears caused by a blow to the knee are accompanied by meniscus and MCL tears. When this occurs, it is referred to as the "unhappy triad". If your meniscus is damaged, you should definitely avoid exercises that could aggravate this condition. To prevent ACL injury it is important to have strong quadriceps and hamstrings muscles. Women experience ACL tears 7-8 times more frequently than men due to hormonal and anatomical differences. Women tend to have stronger quadricep muscles at the front of the thigh compared to their hamstrings at the back of the thigh. This creates an imbalance that can increase the stress on the ACL when landing a jump. Once the ACL has been damaged, an individual's risk of developing knee osteoarthritis (degeneration of the joint cartilage) later in life is 9 times higher. If the anterior cruciate ligament is torn, surgery may be recommended by your doctor, however, there are occasions when surgery is not necessary, or not worth the potential for further damage. This is because the ACL is not always crucial for people that do not exercise heavily. 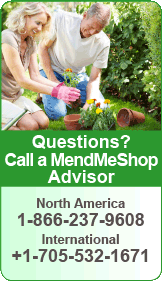 As with all recommendations for surgery, it is usually advised to get a second opinion. Minor ACL tears may go unnoticed at first but will appear a few hours later with pain and swelling. Even with a slight tear, your knee may feel unstable and may 'give way' with sudden movements. 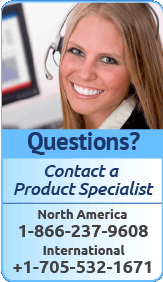 More serious ACL tears or ruptures are accompanied by severe pain and often a popping sound. Swelling in the knee usually gets worse for several hours following an ACL tear, with the most rapid swelling occuring within the first 4 hours. The knee may feel as though something has snapped and walking or bending the knee is usually impossible. Palpation and observation is often the first step in diagnosing. The joint will be examined for swelling, bruising and deformities. Next the doctor pressing lightly on the knee to check for the degree of tenderness, swelling and warmth. Some tenderness usually indicates a mild, or grade 1, ligament sprain and acute pain indicates a more serious injury such as a tear. An arthroscopy may also be used to allow the doctor an internal look at the ligament. A tiny camera is inserted into the knee and the doctor can use a small surgical instrument to gently tug at the ACL to determine the extent of the damage. An arthroscopy can be performed on an outpatient basis. After a physical exam has been completed, an x-ray may be required to rule out the possibility of a bone fracture. A magnetic resonance imaging (MRI) scan may also be done to determine the extent of the ACL injury and to discover whether the menisci or any other ligaments have been damaged. If ACL reconstructive surgery is necessary, remember that proper post-surgery rehabilitation is very important, perhaps even more important than the surgery itself. Activities should set out to promote healing, increase flexibility in the knee and strengthen surrounding muscles. Your physical therapist will probably set up a "passive range of motion" program, and put you in a hinged knee brace for a month or two to prevent hyperextension or hyperflexion in the knee. An important point for ACL patients to remember after surgery is that every effort must be made to increase range of motion and flexibility at the knee. Treatment differs from case to case depending on the degree of instability in the knee and the patient's activity level. Treating an ACL injury with rest, a Cold Compress or Ice Pack and Deep Tissue Regeneration Therapy will help reduce inflammation and improve the function of the knee so you can return to your normal activities. Once the ACL has improved and activities can be resumed, you will first want to build muscle strength around the knee under the guidance of a physical therapist. Using these therapies after surgery will also control pain and swelling, reduce tissue damage, and speed the bodys own healing rate (via an increase in blood circulation with the T•Shellz Wrap®). 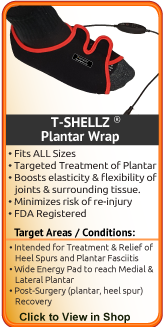 The elongation and increased elasticity of soft tissue after a T•Shellz Wrap® treatment will help reduce your risk of reinjury during stretching, and overall, help advance your recovery process. You will have a healthier knee with a greater range of motion than if your recontructed ACL was left untreated. 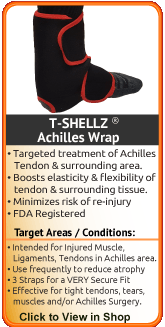 After the inflammation and swelling is gone you can begin to treat your ACL tear with a T•Shellz Wrap®. This wrap induces a deep heat in the treatment area via electromagnetic energy, and will have a secondary effect of increasing blood circulation in the area. 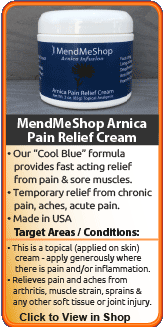 The increased blood flow assists your own body in healing soft tissue. During your recovery, you will probably have to modify and/or eliminate any activities that cause pain or discomfort in your knee until your pain and inflammation settle. Taking the time to care for your knee properly will have your knee back to normal faster and allow you to get back to the activities you enjoy. The more diligent you are with rest, treatment and rehabilitation, the faster you will see successful results! If an injured ligament does not strengthen appropriately or you continue to experience the knee giving way, arthroscopic surgery and ligament reconstruction may be necessary. An important point for ACL patients to remember is that after surgery, every effort must be made to increase range of motion and flexibility at the knee. Weakness in the knee can usually be eliminated by extra strengthening exercises, but increased stiffness can sometimes be permanent if not scar tissue is not treated. 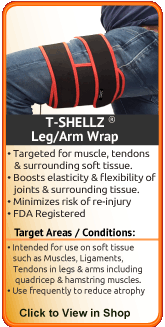 Not only will the TShellz Wraps help to boost the flow of blood in your knee, but the deep heat will help increase the range of motion in your joint by increasing flexibility and elongating the surrounding muscles, tendons and ligaments. 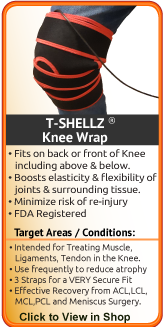 Ask your physical therapist about the Knee TShellz Wrap to see if it is recommended for your reconstructed ACL! 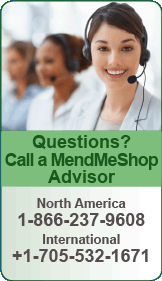 As with all medical devices, make sure your physician approves of any treatment plan you decide to take. If your knee is unstable or weak, wearing a brace during exercise and activity can reduce the risk of reinjury to the ligament while your knee is regaining strength.